In math expression input problems, learners enter text that represents a mathematical expression. The text is converted to a symbolic expression that appears below the response field. Unlike numerical input problems, which only allow integers and a few select constants, math expression input problems can include unknown variables and more complicated symbolic expressions. For more information about how learners enter expressions, see Entering Mathematical and Scientific Expressions in the EdX Learner’s Guide or Entering Mathematical and Scientific Expressions in the Open edX Learner’s Guide. 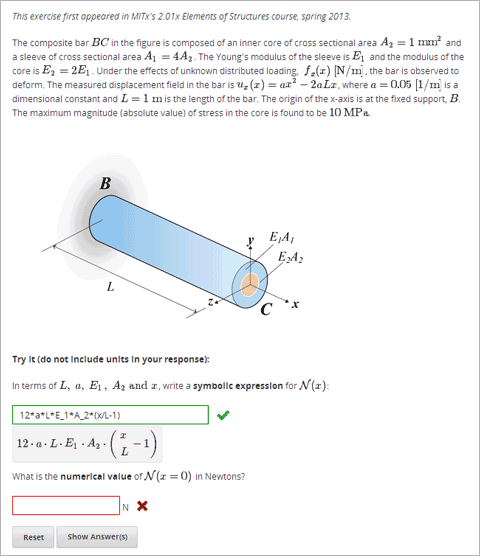 For the math expression input problems in your course, you can use edX Insights to review aggregated learner performance data and examine submitted answers. For more information, see Using edX Insights. For math expression input problems, the grader uses numerical sampling to determine whether a learner’s response matches the math expression that you provide, to a specified numerical tolerance. You specify the allowed variables in the expression as well as the range of values for each variable. When you create a math expression input problem in Studio, you use MathJax to change your plain text into “beautiful math.” For more information about how to use MathJax in Studio, see A Brief Introduction to MathJax in Studio. Math expression input problems currently cannot include negative numbers raised to fractional powers, such as (-1)^(1/2). Math expression input problems can include complex numbers raised to fractional powers, or positive non-complex numbers raised to fractional powers. To create a math expression input problem, follow these steps. Select Math Expression Input. Studio adds an example math expression input problem to the unit. Select Edit. The advanced editor opens. Replace the sample problem XML with your own marked up text. To practice, you can use the example problem that follows. Specifies that the problem is a math expression input problem. The <formularesponse> tag is similar to <numericalresponse>, but <formularesponse> allows unknown variables. type: Can be “cs” for case sensitive, which is the default, or “ci” for case insensitive, so that capitalization does not matter in variable names. answer: The correct answer to the problem, given as a mathematical expression. If you precede a variable name in the problem with a dollar sign ($), you can include a script in the problem that computes the expression in terms of that variable. samples: Specifies important information about the problem in the following lists. variables: A set of variables that learners can enter. lower_bounds: For every defined variable, a lower bound on the numerical tests to use for that variable. upper_bounds: For every defined variable, an upper bound on the numerical tests to use for that variable. num_samples: The number of times to test the expression. Commas separate items inside each of the four individual lists. The at sign (@), colon (:), and pound sign (#) characters separate the lists. An example of the format follows. For example, a <formularesponse> tag that includes the samples attribute might look like either of the following. Creates a response field where a learner enters an answer to the problem in plain text, as well as a second field below the response field where the learner sees a typeset version of the plain text. The parser that renders the learner’s plain text into typeset math is the same parser that evaluates the learner’s response for grading. size (optional) Specifies the width, in characters, of the response field where learners enter answers. Used to define an upper bound on the variance of the numerical methods used to approximate a test for equality. default (required) A number or a percentage specifying how close the learner and grader expressions must be. If you do not include a tolerance, the expression is vulnerable to rounding errors during sampling. The result of such unavoidable errors is that the grader can mark some learner input as incorrect, even if it is algebraically equivalent. type “tolerance”, which defines a tolerance for a number.